It was a pretty big day opening up the contents of an entire studio. I’ve already used the setup a few times and am really happy with it. Now the key is getting the wife to let me keep it in there! (it’s in the living room). I can set it up from scratch in about 20 minutes after a little practice, though it’s really nice to have it there and ready to go whenever inspiration strikes. It’s got great 20+ feet high ceilings, about 14 feet wide and 25 feet deep. It’s a good space for this type of thing, not perfect but it is very workable. I’m excited to do some more portraits in this space and really test it out. So far we have done kids and families in the space, and they have all been great. I can totally see doing band photos and senior portraits in this space. Plus of course family and children’s portraits! 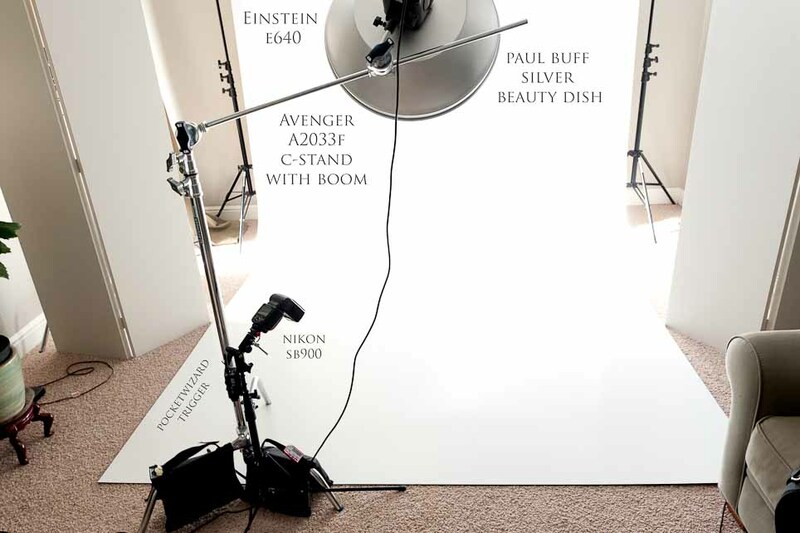 The Paul Buff beauty dish is my new favorite light modifier. It’s large and softish, but with a nice punch to it that you don’t get from a softbox or umbrella. The big octabox is also really beautiful, I think in the right situation it could be really useful. It’s a big package and will be heavy to move around to jobs though. Also got a couple of parabolic umbrellas (PLMs) that I can’t figure out exactly how to put together yet. More to come on those guys. I got three of the c-stands, one with a boom. The boom unit is great for getting the light ‘up and over’ rather than just ‘up and next to’. 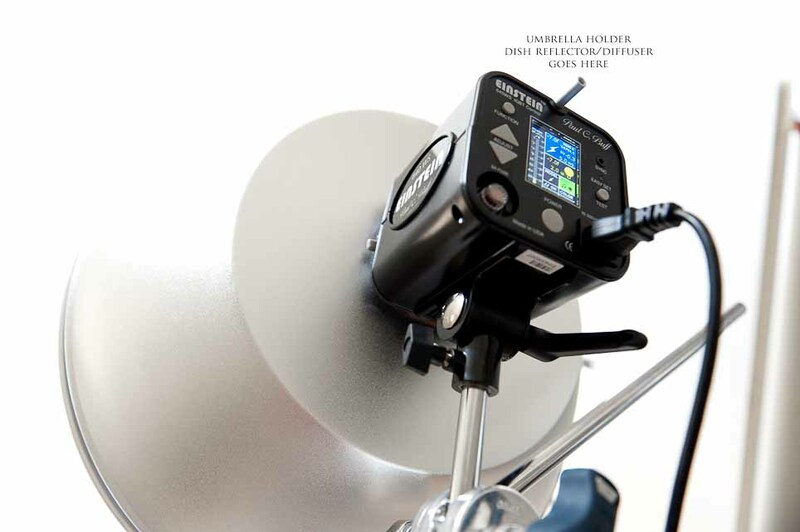 I use the beauty dish like this, then the tri-grip reflector under the chin for a really nice, clamshell, over and under type of beauty light. The Nikon SB and the pocketwizard are there to bounce a little light off the ground, but more importantly, to trigger the flashes via the optical slave. I was going to sync the pocketwizard right to one of the lights, but found that they use a 1/8 to 1/8 miniphone cable rather than the 1/8 to PC jack my other flashes use. One more thing to buy. The beauty dish has a small reflector inside the middle of it that directs the light back onto the dish and out towards the model. It mounts in the top umbrella holder on the Einstein unit. You can adjust it in and out as desired. 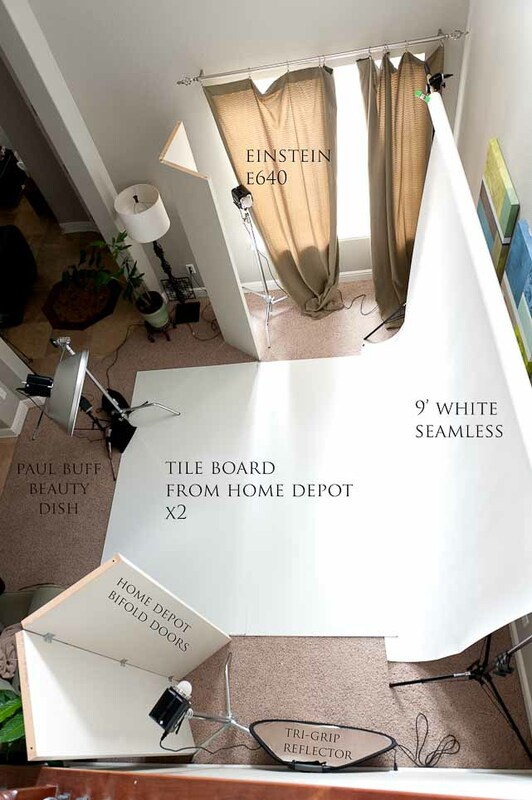 It’s a lot easier to take the beauty dish off and on the flash than the softbox or octa. The holding fingers that hold the modifier to the flash are adequate but not exactly confidence inspiring. It’s on there, but you wouldn’t want to bet the farm on it staying there. Trying to put the octa on the flash while on the stand and holding a camera is an exercise in futility. Zack would say ‘many curse words’ like the Dad in the Christmas story when fixing the furnace! Comment any questions you have (on Facebook or on the blog directly) and I’ll be happy to answer! Crazy setup! Don’t know what it all does but it sounds sweet! Very nice setup man, good deal! I love the PCB Beauty Dish. With the sock on it it’s incredibly flattering, it’s a great modifier. Question: Why aren’t you using the reflectors on the bg lights? Lou – the Einsteins didn’t come with any reflectors! I’m going to get a few an probably some 10 degree gridspots too. The reflectors are pretty cheap, and the big bifold doors work ok for now.